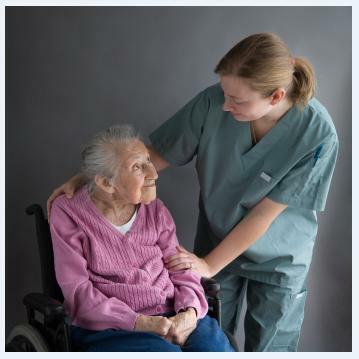 Teaching caregivers safe lifting and transfer practices will reduce incidences of back injury and muscle strains related to transferring or assisting clients moving from their bed to a wheelchair, in the shower or while offering assistance moving about the house. Reminders about safety practices can be included in tasks listed in reliable homecare software or homecare systems, like ClearCare, to keep it in the forefront of a caregiver’s mind. Simple tasks that come up in the course of in-home care, like changing a light bulb, can pose the potential for serious injury. Make it your agency’s policy that caregivers use the appropriate tools for the task at hand. For instance, standing on a step ladder is far safer than using a chair to reach that light fixture. Take advantage of homecare systems, and task notes within homecare software, like ClearCare, that help you note any potential dangers for a caregiver in care plan tasks. Having a set uniform for employees will help ensure that caregivers are appropriately dressed for their job. However, institute guidelines for clothing that allow caregivers to move freely and closed toe footwear, such as tennis shoes, that allow for good traction and easy movement. Homecare systems can be utilized to help caregivers remember when special protective equipment, like gloves, may be required for tasks. Household spills and incontinence accidents can create surface that increases the risk of falls for caregivers and clients. Likewise, clutter in walkways can lead to tripping and falling. Encourage caregivers to be aware of hazards and eliminate them quickly and safely by instituting homecare systems that require caregivers to be constantly aware of safety hazards. As a homecare administrator, you have the power to foster a culture of safety among your caregivers. Encourage caregivers to call and request assistance if they feel uncomfortable completing a task, and make a note of unsafe situations in your homecare software reporting, such as that available from ClearCare. Instituting homecare systems that encourage safety amongst your caregivers will reduce employee downtime from injuries and reduce costs incurred by your agency in workman’s compensation costs. Homecare software, like ClearCare, can help you keep in constant contact with your caregivers, offer safety reminders and keep your workforce productive! Leave us a comment and share what homecare systems you have put in place, or how you utilize homecare software, to increase caregiver safety and reduce workplace injuries.